Pursuant to Italian Civil Code, the contract is the agreement between two or more parties to establish, regulate or terminate a legal relationship about their assets. The parties may freely determine the content of the contract within the limits imposed by law. 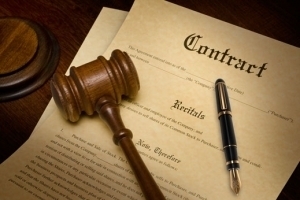 The parties may also celebrate contracts that do not fall into the categories with a particular discipline, if these contracts are directed to make interest worthy of protection according to Law. The contract is concluded when the person who made ​​the proposal has knowledge of the other party's acceptance. The acceptance must reach the proponent within the time he established or in the time usually required depending on the nature of the business or according to uses. The proponent may consider the late acceptance as effective, provided that he gives notice to the other party immediately. If the applicant requires for acceptance a specific form, the acceptance is not valid if it is given in a different form. Contract of sale subject to the approval of the buyer in Italy. Italian lawyers for United States companies in Italy. Composition with creditors in Italy. Italian lawyers for Saudi companies in Italy.